It�s not really a surprise, is it? After all, the Japanese people are known to be very conscious when it comes to the environment. With electric cars poised to be one of the major solutions to the carbon emission problem, it is quite logical that they will make it big in the Japanese market. We also have to consider the fact that electric cars involve a lot of advance technology, and this nation is also well known for that. 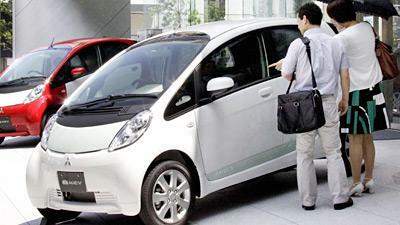 Last week, the first mass-market electric car was launched in Japan. The brainchild of big brand Mitsubishi, the car is called i-MiEV. It is shaped like a bubble (yeah, like something from the future), and it costs 2.8 million yen. That�s roughly $30,000. This price is not the original selling price, though. In fact, the price will only go down to that amount (from 4 million yen or $43,000) after you take into consideration government incentives. This brings me to another point � the importance of government action in encouraging people to become more environmentally-aware. Who would want to purchase a car that is so much more expensive and maybe not as well-performing as the �good old fuel� cars? With such incentives in place, however, the playing field is somehow leveled. Mitsubishi is not the only Japanese automaker that is offering an electric car. Nissan has its Leaf, which it is already taking orders for. This car is much cheaper at around $25,000. Needless to say, other car makers are already rolling out plans to join the fray.